"After 3 years of developing a $89.5 million program to eradicate the invasive light brown apple moth (LBAM) from California, agriculture agencies have admitted that it is no longer possible to eliminate the widespread moth," reports the journal Science. "The main goal now is to "contain, control and suppress" the pest, the California Department of Food and Agriculture (CDFA) announced in a report last week. On March 15, USDA came to the same conclusion in a response to petitions filed by Pesticide Action Network and a group of scientists and activists. According to Pesticide Action Network (www.panna.org), USDA denied the groups' petitions to reclassify the LBAM as a "non-actionable pest" (and thus relax the severe quarantines that are hurting California farmers and nurseries). In February 2007 a retired entomologist found a single light brown apple moth in his East Bay garden. By that summer, major LBAM populations had been found in the Monterey Area. In an attempt to quickly stop the spread of this leaf-eating moth, the CDFA (California Department of Food and Agriculture) declared a state of emergency. This action released them from conducting a required environmental impact report in advance. Monterey and Santa Cruz populations were aerially sprayed from 8pm to the early morning hours with bio-pesticide pheromone products for several nights. The aerial spraying was planned to occur for a few days each month over the next few years in San Francisco, Marin, Monterey and various East Bay cities. Many outraged citizens, city councils and a coalition of ninety public interest groups, immediately organized an effective campaign to stop further spraying in the Bay Area. This impassioned cry of concerned citizens prompted California Secretary of Agriculture A.G. Kawamura to temporarily cancel the planned aerial spraying of other counties throughout the state. 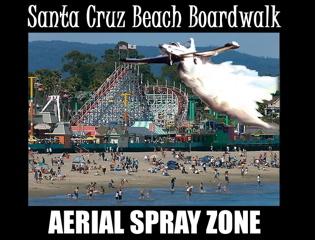 The original spraying in the Santa Cruz area resulted in hundreds of reported human illnesses, 650 seabird deaths and the unexplained deaths of pets and farm animals. The EPA has since revoked approval of CheckMate LBAM-F, the product that was used in the aerial spraying. "We are strongly opposed to the CDFA's entire moth eradication program. Times have changed, and the old methods of releasing chemicals and pesticides throughout the environment, which puts our health in danger, must be stopped," stated Carolyn Cohan, Ph.D., Integrated Pest Management Chairperson for MOMAS (Mothers of Marin Against the Spray, www.momasunite.org). "We must look to the future in sustainable ways that won't harm the environment, animals and our children." In 2008, James Carey, Professor and former Vice Chair of the Department of Entomology at the University of California at Davis and his colleagues Dr. Frank Zalom, National Academy of Sciences scientist and Bruce Hammock, Distinguished Professor of Entomology at UCD Cancer Research Center, sent a letter to Governor Schwarzenegger expressing their concern with the planned moth eradication program. They wrote: (1) the data supporting the argument that the moth would become more economically important than other tortricid leafrollers that are already in the state is unconvincing; and (2) there is no scientific evidence that using the method of mating disruption via pheromones either alone or with augmentative methods is capable of eradicating any insect population. Harrumph! I phoned Professor Carey to ask him why he and his pack of vociferous over-achievers were being such spoilsports. "The Light Brown Apple Moth should not be on a 'Class A' list. This is not a serious pest. And even if it was a more serious pest, there is zero chance to eradicate it," said Carey. "Not a small chance or minuscule chance but basically zero. Eradication is not possible because you're not eradicating an LBAM population but you're trying to eradicate 100,000 LBAM populations. There are millions of pockets of these and each pocket has a separate population. It's similar to cancer. Every little metastasis can regenerate the population. Anything short of 100% effectiveness is control, not eradication." Who did the Light Brown Apple Moth sleep with to get the starring role? Professor Daniel Harder, executive director of the arboretum at U.C. Santa Cruz says the folks at HortResearch in New Zealand (The Kiwi's version of the USDA) have devised effective protocols for controlling LBAM to zero-tolerance levels necessary to meet restrictions for export of crops to the US. "These are classic IPM (Integrated Pest Management) strategies of careful monitoring," says Harder, who traveled there in 2008 on a fact-finding mission meeting with government, agricultural and horticultural entomologists and researchers. New Zealand has a similar climate to California along with many common crops and fauna. His 2008 study reports that in the 1980's, when regular applications of 'broad-spectrum organophosphate' pesticides were used, the moth was considered a problem pest in NZ orchards. These pesticides have short and long-term risks to exposure and long-term persistence in the environment. They also wipe out a plethora of beneficial insects that are natural predators and parasites to many pests. Unfortunately, insects aren't as oblivious as we'd like them to be and populations of them, including the LBAM, developed resistance to the pesticides. When the broad-spectrum pesticides were stopped in 2001, beneficial insects returned to chow down on a variety of leafrollers (a horticultural term used for various caterpillars). Since then, with careful monitoring by sticky traps and a well-timed, target specific, naturally-based insecticide, LBAM has been reduced to a minor pest. Ta-da! Now the moth sits on a New Zealand film-set, in a damp and dank holding area with all the other movie extras, sipping cold coffee and chatting nonstop about upgrading to a stand-in. New Zealand entomological researchers also note that using pheromones placed throughout the state will only work under specific conditions: 1. Extensive, even and complete coverage of the pheromone. 2. Uniform blocks of a single crop. 3. Uniform topography (no slopes, hills or valleys). 4.Low population density of target pest (not too concentrated). This will be difficult to achieve in California's 23,000 square miles of diverse terrain that the moth is now established in. Some experts believe the pest has already been here for at least ten years. 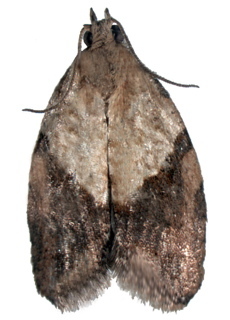 To make matters worse, New Zealand research entomologist, Peter Shaw, asserts that a broadcast of pheromones around the state would not be effective because female moths issue a more concentrated scent plume than the dispersed scent of an aerial spray application or twist-tie and they can modify (evolve and reinforce) their scent, so male moths would still be able to find the females. It's not just the ongoing costs to the California taxpayers, questionable safety, unknown long-term health risks, and disputed efficacy in trying to eliminate this moth that's at stake here. Family farms -both conventional and organic - as well as independently owned nurseries have also been greatly affected by imposed government quarantines, inspections and forced applications of pesticides. One California grower, who chose to remain anonymous, reported losing over $30,000 to comply with the LBAM quarantine regulations. Another explained, that if he took all the different leafrollers he'd found in his nursery in the last 3 years and put them all on one plant, they would have done about $20 worth of damage. As one commented, "Our government's efforts should be going to trading partner negotiations to de-list all leaf-rollers across the national and international trading boards just like the EU has done. The USDA's quarantines are hurting California farmers more than the moth is." Entomologist and distinguished Fellow of the California Academy of Sciences, Frank Zalom believes naturally occurring biological control agents will become increasingly important for control. "LBAM will eventually be considered an occasional pest that growers need to be aware of and one, which on occasion will require intervention. It seems to be no greater a threat than a suite of other insect pests that already occur locally." Zalom believes the damage that occurs in commercial settings is manageable with monitoring together with cultural approaches and low risk pesticides, similar to other widespread leafroller species. "I'm a naturally optimistic person, but I really feel-after listening to countless scientists and doctors and seeing so many sick kids recently-that we are quickly going over a toxic cliff in our country," says Debbie Friedman, GreenWave Strategies consultant and Chair of MOMAS. "As parents, we have a moral obligation to our children and to future generations. Last year, when MOMAS helped stop the spraying of chemicals from airplanes, several people told us that no group or person had ever stopped an aerial spraying. But Californians rose up like they hadn't in decades and it was stopped. We are asking our government officials to live up to their promise to make policy decisions based upon science. I think that many Americans think that 'someone else will take care of it.' But, I've learned first hand that our elected officials need to hear from us often. When they hear from large numbers of people, they will listen." Extra Credit:Join www.Momasunite.org or 'MOMAS' on FaceBook for periodic LBAM updates and action alerts.